Take to amazing waves on the Port Canaveral Airboat Tour. You will enjoy the amazing sights of this multi-faceted port as you coast over the cool Atlantic waters! The airboat ride was fun. Airboat tour was a little rushed but very exciting. Long bus ride to the airboat. Great Airboat tour. Saw lots of adult and baby gators and the airboat captain was amazing. Great tour and guide, say a lot of birds, alligators and wildlife, had a taste of an alligator bite. The airboat was fun if a bit chilly (hey it was October at 10 in the morning). The airboat ride and Alligator Jungle was awesome! Very friendly staff. The tour was on time, the places we visited were entertaining and fun. The whole family loved it. 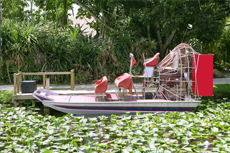 If we go to Florida on our own we are sure to revisit both the airboats and Swampy. Nice, quick tour. Saw some alligators. Enjoyed the boat ride. 30 Minute Airboat ride with 4-5 visit to Jungle Adventures Animal Park. Enjoyable and informative--first ride on an airboat. Very informative. Our guide was great. we say lots of alligators and blue heron, turtles, buzzards, cattle, and fishermen! loved it. Great ride. A lot of gaters. Excellent. The location was changed at last minute (due to water levels). So even though the time on boat was shortened from what was originally booked, we thought it was great. Had a good time on our first airboat ride at Lone Cabbage Fish Camp. Great Ride and saw many alligators and other wildlife. Very good excursion, but at $89, I thought it a bit pricey. Was worth the money. Saw many alligators. Ate alligator bites. Saw some animals from a shelter afterwards.